Kingston University’s Centre for the Historical Record and The National Archives will be presenting an evening of discussion and films on the life of Cesar Picton and other Africans in Georgian London on November 11. 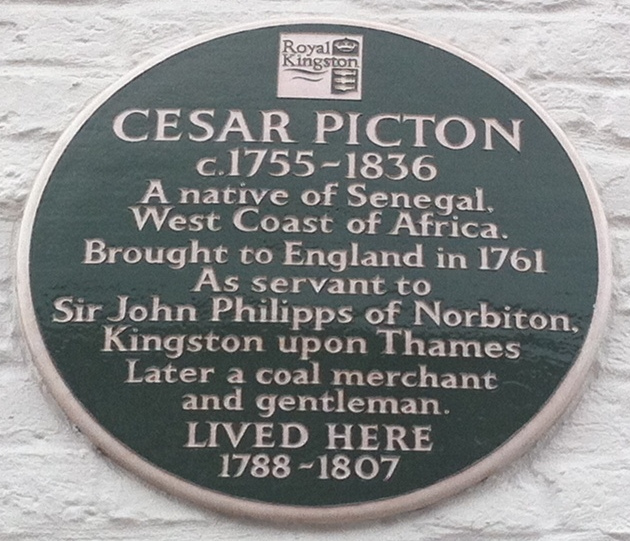 Cesar Picton (1755-1836) was brought to England from Senegal as a gift for a local family in 1761. He went on to become a coal merchant and a wealthy and respected gentleman. He remains Kingston’s most famous eighteenth-century black businessman, and his previous homes in Kingston and Thames Ditton are marked by commemorative plaques. His life and house are part of the Centre for the Historical Record’s Kingston Heritage trail, and he has also been commemorated at Kingston University where the Picton Room has been named after him. A wine reception will be held here after the event. In the first part of the event artist, film-maker and Kingston graduate Anna Brass and assistant editor Lilly Mehbod will present two short films based on records held in The National Archives and Kingston’s Local History Room. Cesar Picton Part One will present an evocative narrative of Cesar’s early life which also reflects the silences in the archival records. Part Two is based on newly discovered and often revelatory letters found amongst The National Archives’ Court of Chancery documents, which illustrate Picton’s relationships with fellow locals and other white Georgian gentlemen. For parts of this very different film, Anna was also assisted by Kingston historian Nicola Phillips, whose research largely focuses on gender history in Chancery proceedings. In the second part of the event, Dr Miranda Kaufmann will present ‘Africans in Georgian London’. This talk will explore questions raised by Picton’s life, as well as the lives of his other well known Black contemporaries (such as Dido Belle, Ignatius Sancho and Olaudah Equiano), and the estimated 10-15,000 Africans living in Georgian London. Miranda Kaufmann is a freelance historian and journalist, who has worked for The Sunday Times, the BBC and the National Trust. Her first book, Black Tudors, will be published by OneWorld in 2016. Miranda is also presenting at many Black History Month events during October (and into November), which you can find out about here. While the Africans in Georgian London event falls outside of Black History Month (October), it highlights an important and developing focus on Black British history, which explores how Black history is part of national, local and community histories, as well as identifying and celebrating the many ways in which Black individuals have impacted on economic, social, political and cultural histories. Kingston University hopes to continue this conversation well outside of Black History Month, and ensure that Black history becomes part of mainstream discussions about history, every month. This event is part of Explore Your Archive, an ongoing project between The National Archives and the Archives and Records Association. Explore Your Archive encourages people to visit archives and discover the many ways they can learn through, and benefit from, visiting archives across the UK. As well as having our own archives at Kingston University which house among others the Iris Murdoch and Sheridan Morley collections, we are incredibly lucky to have so many connections to local archives, including The National Archives, Kingston Local History Room and Surrey History Centre. During last year’s Black History month Surrey History Centre, which also holds documents relating to Picton, added a web page to their section on exploring Black History in Surrey dedicated to Picton’s story and his Surrey connections. You can find out more about Explore Your Archive and events going on across the country here. All staff, students and members of the public are welcome to Africans in Georgian London. The event is free, but we do ask that you register on Eventbrite. We’re looking forward to seeing many of you there and celebrating the life of Cesar Picton, Black history in Kingston and the resources of our local and national archives. This entry was posted in Events, Local History and tagged Black History, Black History Month, Explore Your Archive, Picton, The National Archives. Bookmark the permalink. To that end, I’m co-organising a series of workshops with Michael Ohajuru at the Institute of Commonwealth studies to ask the question: “What’s Happening in Black British History?. The first one is next week, on 30th October. Read more and register to attend here.